Greetings! We wanted to remind those of you who may be following along via a blog reader or other similar source that we have moved our blog. 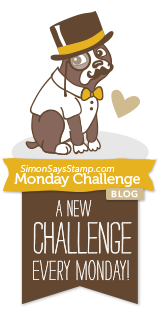 You'll find all our challenges and posts exclusively over here: http://www.simonsaysstampblog.com/mondaychallenge/ - and at our new home you can sign up for email subscription if you'd like posts coming to your in-box, or you can use our new addy in your favorite blog reader/feed app and be updated that way. We've got not just a brand new name, but a brand new vintage Simon badge that you can use on your blogs! Join us every Monday for a new challenge - see you at the Monday Challenge Blog!